Half of the family was able to enjoy some bona fide deep dish pizza last weekend in Chicago while the rest of us made do with Domino’s. I’m sure the ChiTown ‘za was better than Domino’s. And, if you read this post you might be interested to know The Hut was better than Domino’s too. In any event, we decided to try some local deep dish all together this weekend and ended up in a booth at Green Mill. What with the garlic bread appetizers and the really deep deep dish pie they served up–and the two squirrely children we brought with us–we ended up bringing a lot of food home. Looks like someone in Green Mill’s marketing department–or at their agency–has been paying attention to social media 101 with an eye to their consumers. All too often marketers–client- or agency-side–cue up Facebook marketing as a way to engage audiences. That makes sense if you have an audience that wants you to engage with it. But if you happen to be one of the approximately nine brands that the average fan has decided to “like” on Facebook, then engagement shouldn’t be leading with warm and fuzzy fun or discourse. The fuzzier marketers will be promptly unfriended by the above thirty-six to forty percent because only 29% seek fun and entertainment. A much smaller population (13%) want to interact, whatever that means. 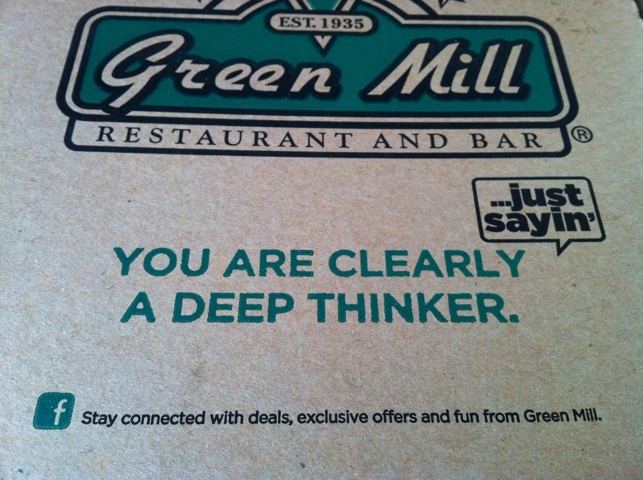 So to Green Mill I say: Congratulations on getting it right on Facebook. Also: Thank you for the awesome family pizza night! Stats according to Subscribers, Fans & Followers, published last year by ExactTarget and CoTweet. Every so often branding magic happens. It’s when two different brands realize they both could benefit from a mutual partnership. Like the clown fish and coral. Or algae and lichen. Or Clementines and Trojans. Here’s another. Facebook announced this week that they were going to be making yet another tweak to their user experience: how Facebook users flag that they support a fan page on their network. No more “fanning” of pages. Now users will simply click “like”. It’s a simple enough concept. I think it’s a step closer to Facebook’s goal of letting users “like” content on the Internet in general–taking over from bookmarking services like Digg or de.lici.ous, essentially. Simple or not, users are going to get pissed. And there will be an uproar. “Bring back the old Fan Page” fan pages are sure to be launched. Enter: Tylenol. For when you have a headache that just won’t go away. And just so we’re clear: I’m not a USA Today hater. Their iPhone app still rocks for how easy it makes news and story sharing. The intent is to refer to the paper’s broad distribution. See for instance how Starbucks decided to bring it back into it’s cafes due to demand . But the new creative leaves a bad taste in my mouth. Sensationalist “news” rags should give America what it wants. Sports journalism should give America what it wants. Entertainment journalism: ditto. But “news” papers owe it to their readers to research. Interview. And report. Regardless of whether or not the outcome is something we wanted to hear. In the latter instance, perhaps it’s up to us to do something about it.